According to Irvine, Ca based CoreLogic, cash sales made up 31.9 percent of total U.S. home sales in May 2015, down from 35.1 percent in May 2014. The year-over-year share has fallen each month since January 2013, making May 2015 the 29th consecutive month of declines. Month over month, the cash sales share fell by 1.7 percentage points in May 2015 compared with April 2015. Due to seasonality in the housing market, cash sales share comparisons should be made on a year-over-year basis. The cash sales share peaked in January 2011 when cash transactions made up 46.5 percent of total home sales nationally. Prior to the housing crisis, the cash sales share of total home sales averaged approximately 25 percent. If the cash sales share continues to fall at the same rate it did in May 2015, the share should hit 25 percent by mid-2017. 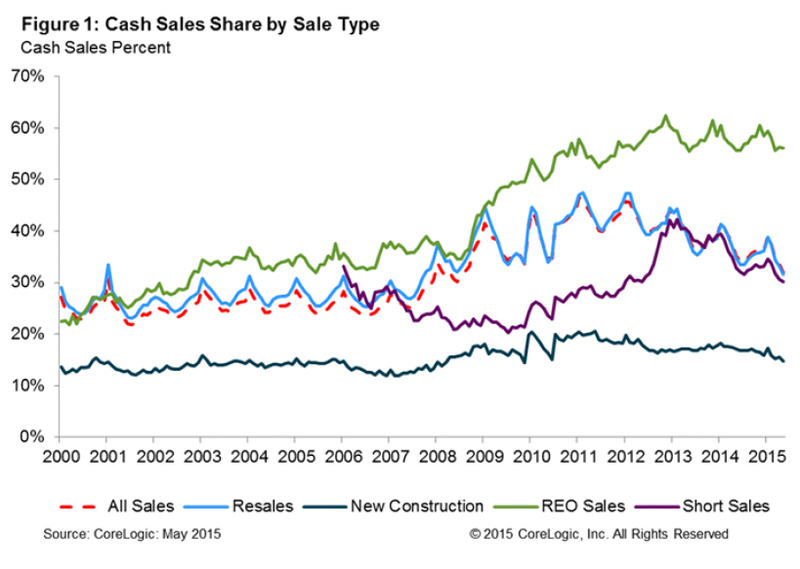 Real estate-owned (REO) sales had the largest cash sales share in May 2015 at 56.1 percent and was the only sales category to see a year-over-year increase in the cash sales share. Resales had the next highest cash sales share at 31.5 percent, followed by short sales (30.1 percent) and newly constructed homes (14.7 percent). While the percentage of REO sales that were all-cash transactions remained high, REO transactions made up only 6.4 percent of all sales in May 2015. In January 2011 when the cash sales share was at its peak, REO sales made up 23.8 percent of total home sales. 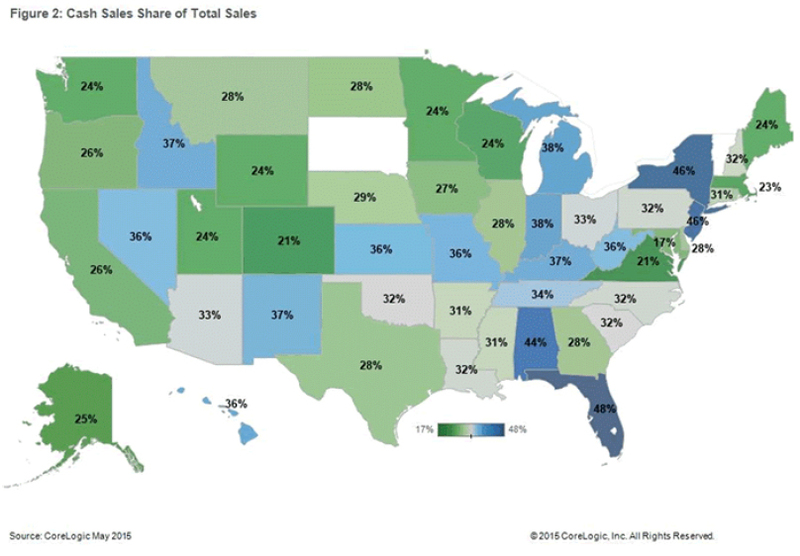 Resales typically make up the majority of home sales (about 82 percent in May 2015), and therefore have the biggest impact on the total cash sales share. Florida had the largest share of any state at 47.8 percent, followed by New York (45.8 percent), New Jersey (45.8 percent), Alabama (44.2 percent) and Michigan (38.4 percent). Of the nation's largest 100 Core Based Statistical Areas (CBSAs) measured by population, West Palm Beach-Boca Raton-Delray Beach, Fla. had the highest cash sales share at 58.1 percent, followed by North Port-Sarasota-Bradenton, Fla. (55.9 percent), Cape Coral-Fort Myers, Fla. (55 percent), Detroit-Dearborn-Livonia, Mich. (54.6 percent) and Miami-Miami Beach-Kendall, Fla. (54.6 percent). Syracuse, N.Y. had the lowest cash sales share at 11.6 percent.